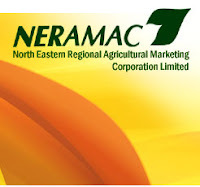 North Eastern Regional Agricultural Marketing Corporation Ltd. (NERAMAC), a Govt. of India Enterprise under administrative control of Ministry of DONER, Govt. of India, invites applications from experienced professionals with outstanding competence for filling up of following positions for its flag ship Project “ONE” (ORGANIC NORTH EAST) On “Contract Basis” For Head Quarters at Guwahati and Delhi Office. Consolidated pay: 6 lac p.a. Consolidated pay: 6 lacs p. a.
Labels: jobs assam,jobs in assam,NERAMAC,North Eastern Regional Agricultural Marketing Corporation Ltd.